I've mentioned it before, but laundry is a chore that I don't despise. In fact, I don't really dislike it either. Truthfully, I sort of do like it. To be honest, I like it quite a bit. Okay, fine. I love laundry. There, I've said it. It might be strange, but there's just something about the way that the clothes go in dirty and come out dry and clean that is so immensely satisfying. When it comes to folding and putting away those clean clothes, well, that's another story. For now, I just like enjoying the process. Pretty, aren't they? While some people get a thrill of looking at cars, motorcycles or boats, I'm dying to run my hands over this set, open and close the doors, and examine each and every button. 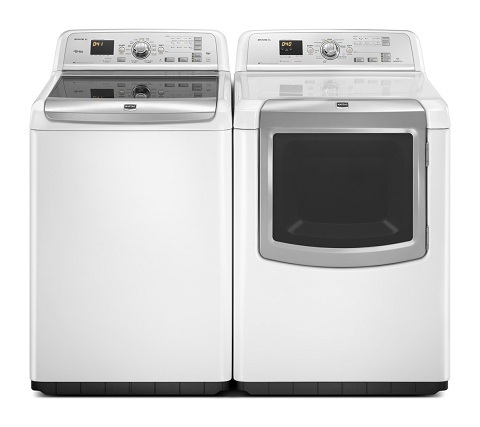 These are the Maytag Bravos XL High-Efficiency Top-Load Washer and Maytag Bravos XL High-Efficiency Electric Steam Dryer and, over the course of the next few months, you'll be hearing more about them. I'll be putting these beauties thoroughly to the test to see if they prove to be just as high quality, powerful, efficient, green, and easy to use as they claim. Both of these appliances contain features galore, but I'm currently drooling over the 4.6 cu. ft. capacity of the washer (we're talking an ability to clean 21 towels in a single load!) and the Auto Refresh Steam Cycle in the dryer that helps to smooth out wrinkles with a fine mist sprayed into the heated drum. Iron? Who needs one of those when the Bravos XL can do it for you? Whether you love doing laundry or you hate it, if you're in the market for a new washer and dryer, stay tuned to hear all about the Maytag Bravos XL. I can't wait to take them for a spin! 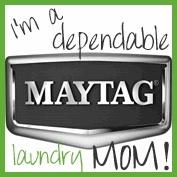 I wrote this post participating in a Maytag Moms Dependable Laundry Ambassador program by Mom Central Consulting on behalf of Maytag. I will be provided with a Maytag washer and dryer set to facilitate my posts. YAY! I'm so excited for you, those are gorgeous! I can't wait to hear more! How exciting for you! I have a similar Whirlpool Cabrio and just love it. I can fit a queen size bedspread in it! I actually wash big things for my Mom and sister, because theirs are too small. LOL! Woot Woot! I can't wait to hear all about them! how awesome!! i don't mind doiong laundry- we could really use anew washer/dryer but can't afford it right now.